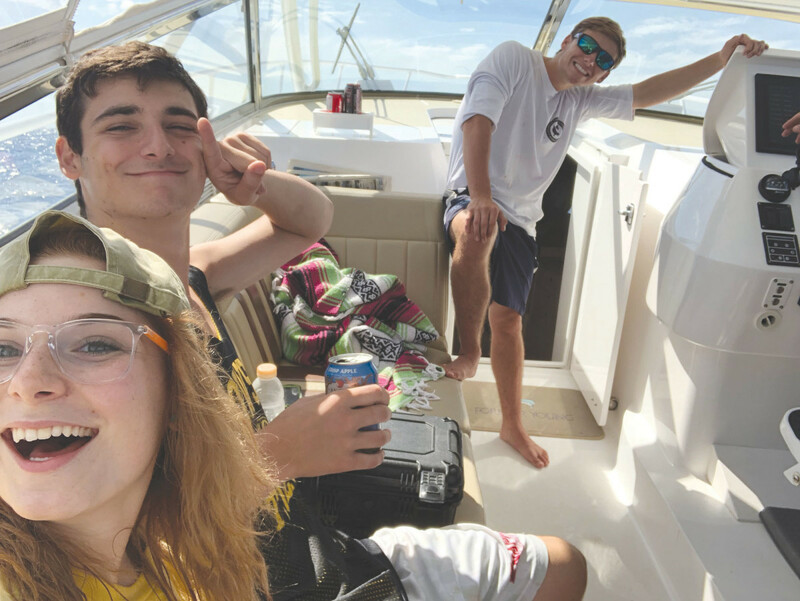 Mollie, David and Max — the writer’s kids and favorite fishing crew just before they departed for college. Who knew that chasing wind-whipped Doritos through the cockpit of a cruising boat could trigger a flashback? 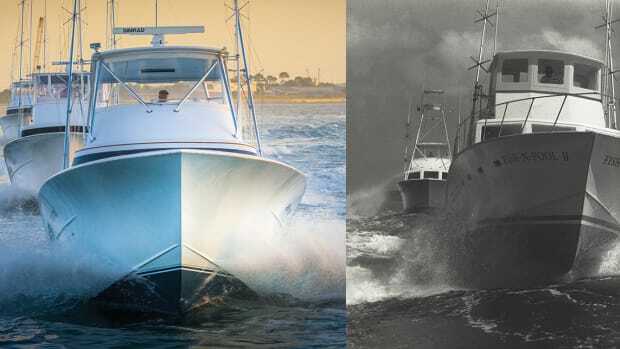 I was grasping at the chips in the whirlwind, frantically trying to prevent an epic mess, when I had a fuzzy vision of myself at 3 or 6 or some other vaguely young age, sitting on the motor box of a Chesapeake Bay deadrise owned by a friend of my father’s. My chips had escaped the bag and were blowing across the deck. Dad was on his hands and knees grabbing at them, with a slightly aggravated look on his face. He had asked me not to make a mess. He heard me cry. He looked up from the deck and smiled. I blink, and the flashback ends. I look up from the deck at my own boys and smile. They’re consumed with laughter, tremendously amused by my fumble. My daughter is documenting the event with her smartphone. It’ll be great on Facebook, she tells me. Then the three of them mercifully join me in the chip chase, lest the owner of this neat-as-a-pin 43 Intrepid happens to glance aft from the helm before I finish cleaning up. We all want this trip to be a good one, because it’s the last of its kind. Like all of us who have children, I’d always hoped to be a good father. I know, of course, that there were times — many times — when I could have been a better one. But I’ve always felt secure in the knowledge that I couldn’t possibly be the worst dad in the world, because I took my kids fishing. I don’t mean once or twice a season. I mean that each and every time my boat left the dock, they had reserved spots on board. I wouldn’t deny them one sunset over the Chesapeake Bay, one hands-shaking approach to a feeding frenzy, nor one glimpse of a mahi-mahi slicing through the chunks. 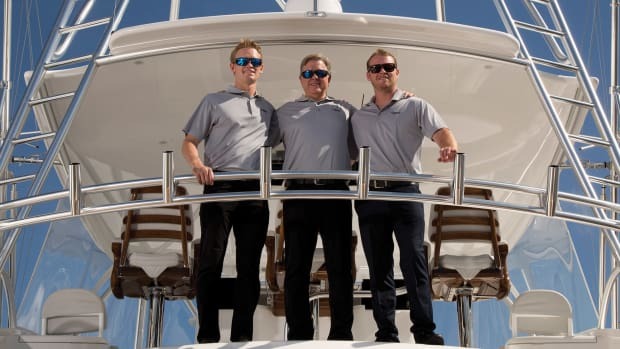 From the time they were old enough to wrap their hands around the handle of a fishing rod, my daughter, Mollie, and her twin brothers, David and Max, all knew there was room for them on board. 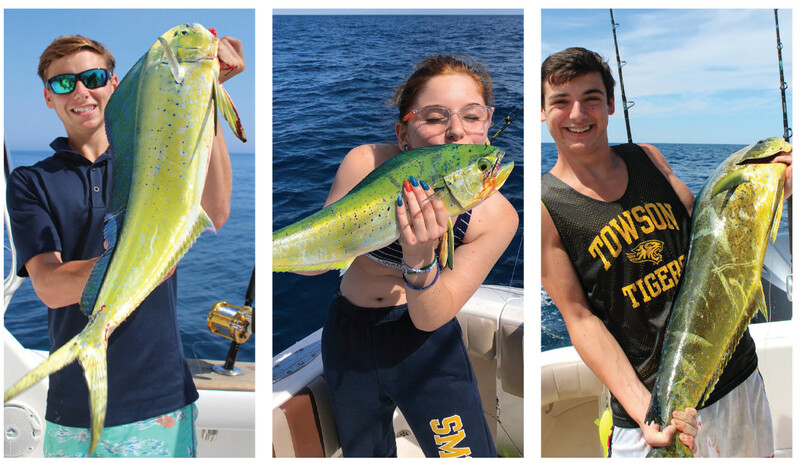 The mahi trio: Max, Mollie and David grew up fishing with their father, providing plenty of entertainment as they chased fish and made memories. The payback has been immeasurable, keeping the family tight and distracting the kids from some of life’s less desirable temptations. 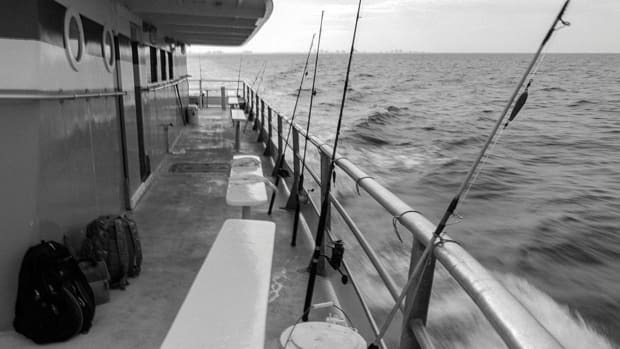 Those are the reasons — unassailable reasons — we put the “good” and “clean” in front of the “fun” when we talk about fishing with the family. Those are the reasons we fish together in the first place. But there’s also been an unexpected payback. 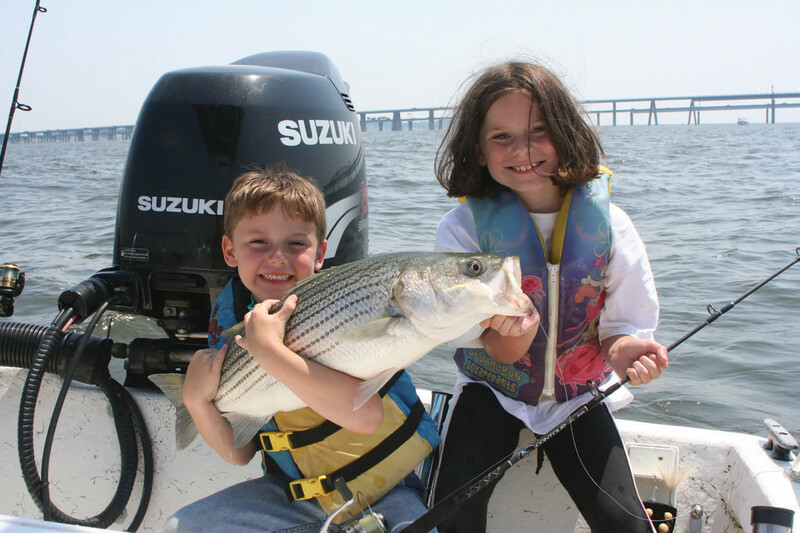 While fishing with friends is always fun, fishing with the kids can result in off-the-charts entertainment value. A blur of two decades of feel-good moments is buried in my memory. There’s the day 3-year-old Max popped a live fish into his mouth, then shook his head no as I begged him to spit it out. 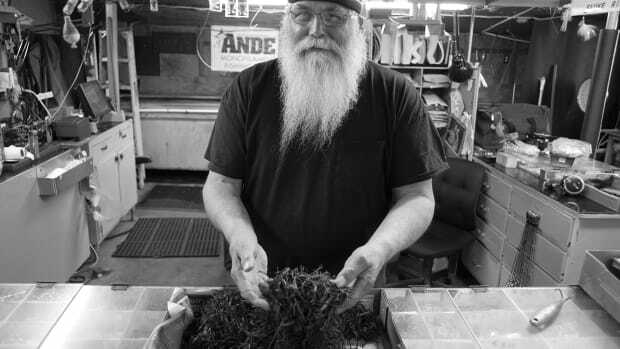 There was the time David screamed bloody murder at 5, after a bloodworm bit him, a solid decade before he’d get his first summer job sorting thousands of bloodworms at Marty’s Bait and Tackle. There’s the time I forgot to bring Mollie’s Barbie rod and instead handed her a grown-up version, increasing her cast’s Arc of Destruction until it terminated at the back of my head. They graduated to premeditated antics as they grew older. 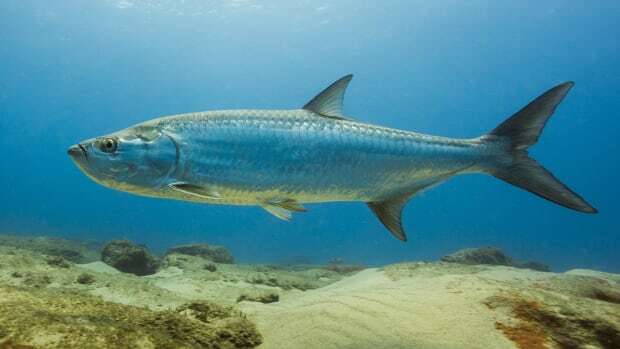 One chilly spring morning while fluke fishing, a live bull minnow mysteriously appeared inside my water bottle, where it swam tight circles as I tilted back for a swig. On a warm summer afternoon, my chartreuse jig somehow turned pink. One boy dropped a live eel down the other’s back when the cobia bite was slow. Someone got the notion to pull a fish out of the cooler, insert a bottle of Gatorade into its mouth, and use it as a fish koozie. Recently, this has become something of a tradition: drinking out of the biggest fish in the cooler. I’m not sure I understand how this silly ritual took hold, and I worry that there’s something slightly unbecoming about using a dead fish as a temporary drink holder. But I do know that it makes everyone aboard laugh uncontrollably and certainly falls into the category of “good times shared.” Most important, every time it happens, I am relieved that Instagram doesn’t work in the canyons. 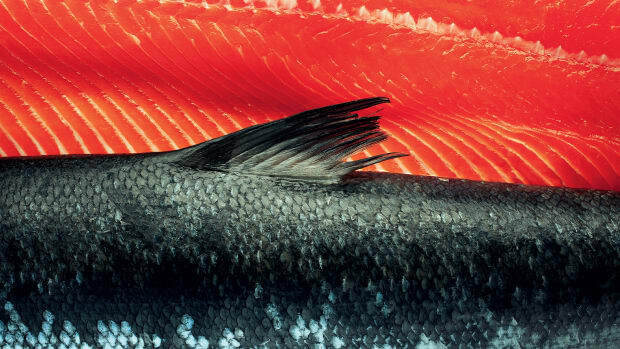 There were a lot of memorable fish in those two decades, too: the cow striper I thought for sure was a ray and was ready to break off until the kids insisted they wanted to see it first; the boys’ first double date with a pair of bluefin tuna; the puffer fish scooped barehanded from floating sargassum as we trolled by. Dad thought this striper was a ray and wanted to break it off. Max and Mollie knew better. 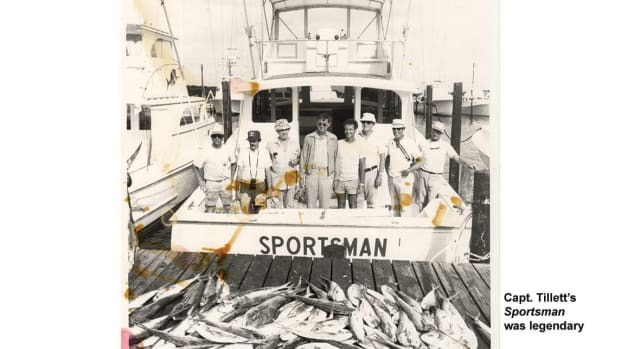 And yes, there were fishing-generated tugs at the heartstrings, such as the day the twins pooled every coin in their piggy banks and tried to give me $7.85 so I could afford that pair of new outboards we needed. There was the time Mollie persuaded me to take our beloved and terminally ill dog, Copper, out on the boat for one last evening of fishing, just days before he left us. There were trips that ended with “thanks, Dad” in that rare tone of voice that lets you know they really mean it. This past summer, we had the exceptionally good fortune to have a friend invite us all out for an offshore trip on his boat, the Intrepid, which is much larger and more capable than my own. Somehow, all four of our work schedules concurred. My kids and I took turns rigging ballyhoo, shucking weed off the baits and steering the boat. The fishing was slow, and it was one of the best trips ever. That’s all come to an end this fall. The tuition bills have been paid, the roommates have been assigned, and my three most reliable fishing buddies have moved out of the house. Of course, we’ll go fishing together in the future. We have plenty of summers and vacations ahead. But the big countdown is over. Mollie, Max and David have gone off to college. For nine months out of the year, my boat will be a little quieter and a little emptier, no matter who’s on board. Someday, maybe, my kids will have children of their own. 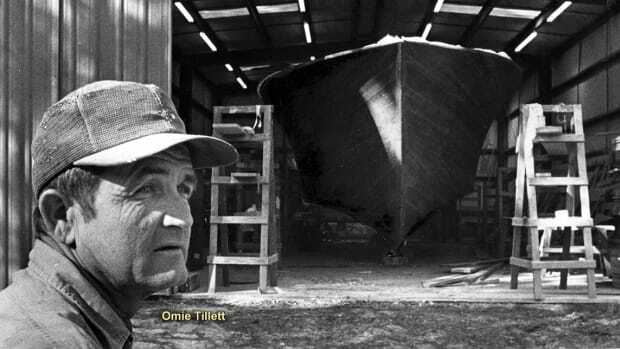 Then, I expect there will always be a spot open on Granddad’s boat. Always. And there’s one thing they’ll be able to bet on: I’ll bring plenty of chips.